As US sportsmen protest against racial inequality by “taking a knee” during the country’s national anthem at sporting events, artists at Frieze and elsewhere in London are continuing the debate by subverting colonial statues, other state symbols and the American flag. The celebration and exploitation of black athletes is a topic that Jean-Michel Basquiat, who is the subject of a major retrospective at the Barbican this week, repeatedly addressed in his work, and the US artist Hank Willis Thomas has made images that explore the commodification of African-American sportsmen for years. “[The] multi-billion-dollar NCAA [National Collegiate Athletic Association] industry [is] built primarily off the free labour of the descendants of slaves,” he told the New York Times in 2012. At Frieze London, a new sculpture by Thomas of a basketball balanced on top of a pair of bronzed hands pressed together in prayer appears timely in the light of recent actions by basketball and American football stars. The work, Faith (2017), is available at New York’s Jack Shainman Gallery for $65,000. Monuments to Confederate generals are being pulled down across the US after a white nationalist rally turned violent in Charlottesville, Virginia, in August—but the issue is a global one. The Rhodes Must Fall movement began in 2015 as a protest to remove a statue of the British colonialist Cecil Rhodes at the University of Cape Town, and at Frieze London, South Africa’s Goodman Gallery is showing a new painting by the Johannesburg-based artist Mikhael Subotzky of the Victorian imperialist with a whitewashed face. Priced at $15,000, CJR (detail) (2017) was sold at yesterday’s VIP opening. Another of the gallery’s artists, the Angolan Kiluanji Kia Henda, is presenting Under the Silent Eye of Lenin (2017) as part of Frieze Projects. It includes three reproductions of a bust of the Communist leader that once stood in Angola’s main square; one of the busts, impaled with nails, resembles a witchcraft talisman. The artist likens colonial statues to people whose visas have expired, but says they should remain on display “not to celebrate them, but to place them within our own history”. 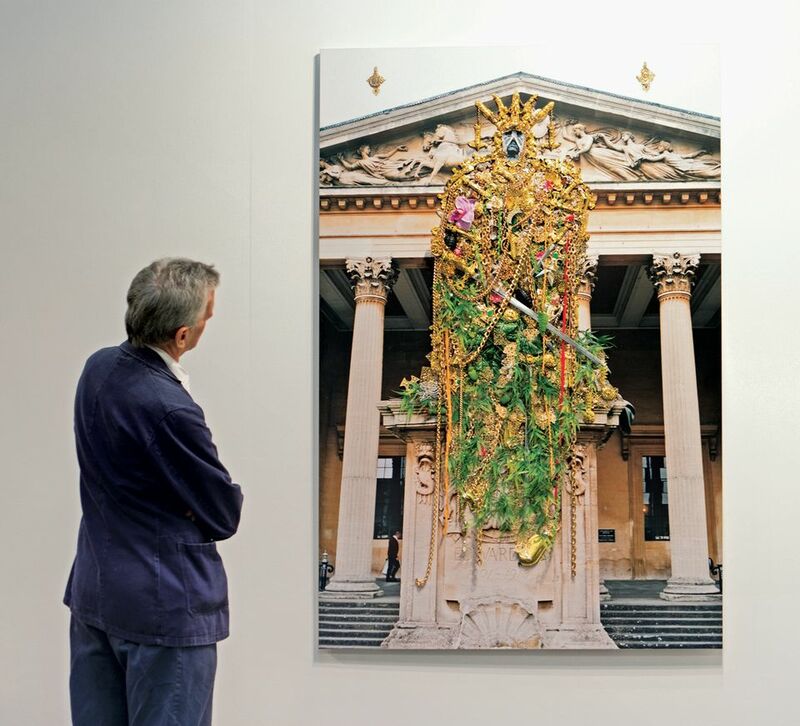 Monuments to British and Irish colonialists, including Edward Colston and Edmund Burke, come under scrutiny in three photographs embellished with cowrie shells and plastic jewellery by Hew Locke on P.P.O.W.’s stand (priced at $40,000 each). Created for the exhibition Artist and Empire at Tate Britain in 2015, the figures are all “men who abused their power economically through the slave trade”, says the gallery’s director Trey Hollis. Alt-Monuments, a talk at Frieze London tomorrow (12.30pm), will further examine how history is commemorated in public places. Meanwhile, the US and Confederate flags are being covered in wax, tie-dyed, burned and buried by artists showing across London. Jasper Johns’s Flag (1958), which was created during the McCarthy era and forms the centrepiece of his current exhibition at the Royal Academy of Arts, is perhaps the most famous depiction of the stars-and-stripes in art history. 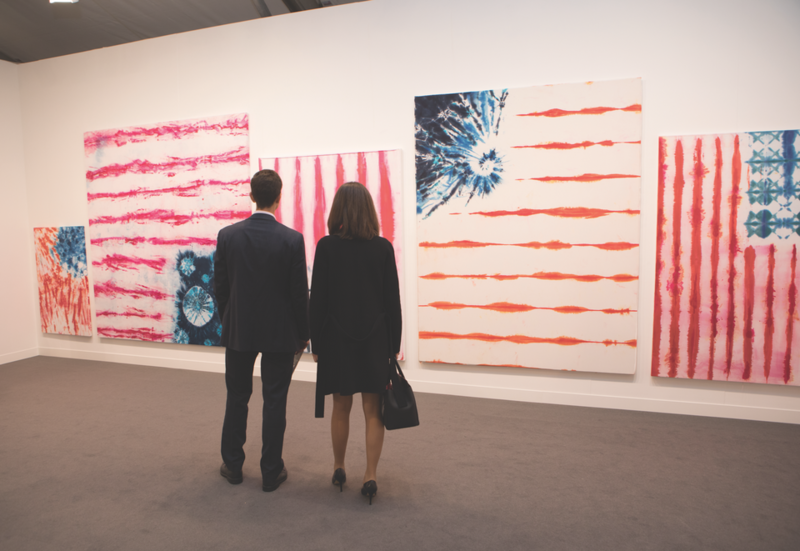 Back at Frieze, Massimo De Carlo gallery is showing six tie-dyed flags by the Polish artist Piotr Uklanski that combine a sense of hippy freedom with the somewhat more austere connotations of the US flag. Created in 2012, the works (priced between $75,000 and $130,000) have become “prophetical of a situation where freedom seems to be at stake in the US”, says the gallery’s director Flavio del Monte. The works prompted one bystander to wonder if anyone had knelt before them yet.